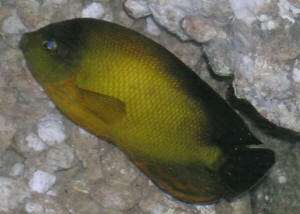 Pomacanthus chrysurus, the Ear-Spot Angelfish. 7 cm. photo by Hiroyuki Tanaka. I have another ID question. I saw a fish in a LFS that was labeled as a "Yellowfin angel," but this was most definitely NOT a Centropyge flavipectoralis. 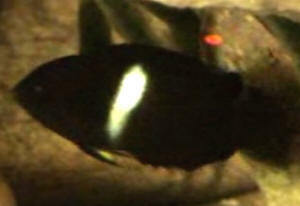 The fish did appear to be a Centropyge angel based on body shape and size. However, its color was a bright yellow with a black square shaped patch covering most of body's rear third. The tail and fins were yellow. I was under the impression that Centropyge did not undergo dramatic color changes as they aged. 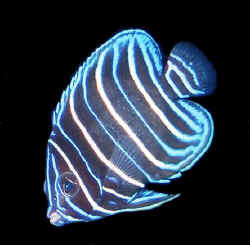 I was unable to find anything on Fishbase that resembled this beauty. <Mmm, have you looked here, part 1 through 3? Bob, have you sent this to the chap? 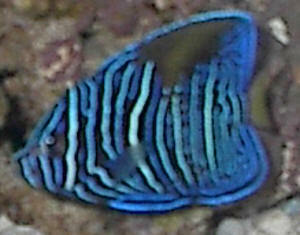 Did some follow up on the ID and sent the chap a link with a photo of a juvenile Rock Beauty. Just some follow up on above subject. 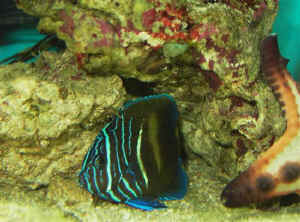 Look at the last photo on this link, is this the fish you saw at the LFS. ...and Bob comes through again. 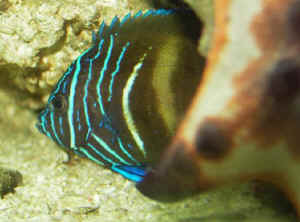 I looked up pics of the juvenile H. tricolor and that was a near perfect match. Thanks.